Here is the opportunity for you to sign-on to your own Kyoto Protocol and help to reduce greenhouse gas emissions. 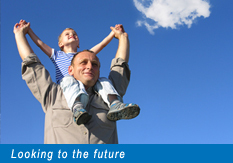 The newly elected Australian Government is making its Kyoto Protocol promise to future generations and we can help to make real that promise by acting now as individuals. Most of us genuinely want to improve our world while ensuring future generations get the same opportunity. But sometimes, often without knowing it, many of us are causing negative impacts on our environment, our social well being and our economic sustainability. This affects our daily lives and those of future generations. 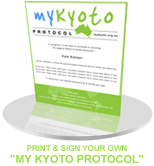 STEP 3 Enter your name then you can generate your own Protocol certificate to print and sign!